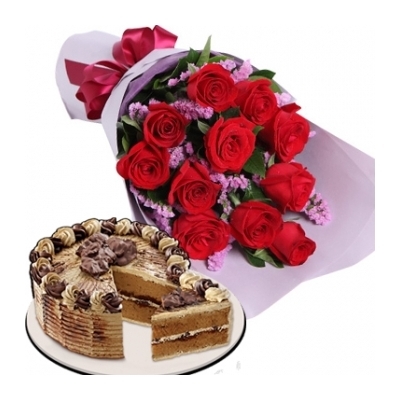 Send 12 Red Roses with Mocha Crumble Cake To Nationwide in Philippines. | Delivery Roses with Crumble Cake To Nationwide in Philippines. 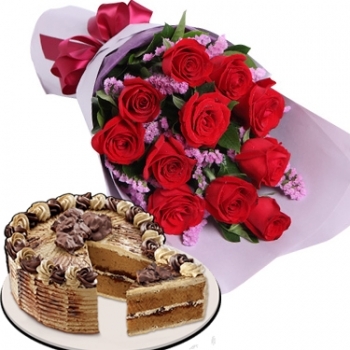 Beautiful 12 Red roses with Mocha Crumble Cake by red ribbon,Mocha chiffon cake bursting with rich mocha cream, filled and topped with crunchy chocolate crumble. - Cake Available only for most of major towns/cities anywhere in the Philippines. - PhilippinesRose.Com reserves right to cancel or request for pick-up any CAKE ORDER if delivery address is out of coverage area.